Gruel is made as required and a bowl is ingested every morning for breakfast. It is stored in sealed plastic container and frozen until required. This completely replaces any commercial breakfast cereal. 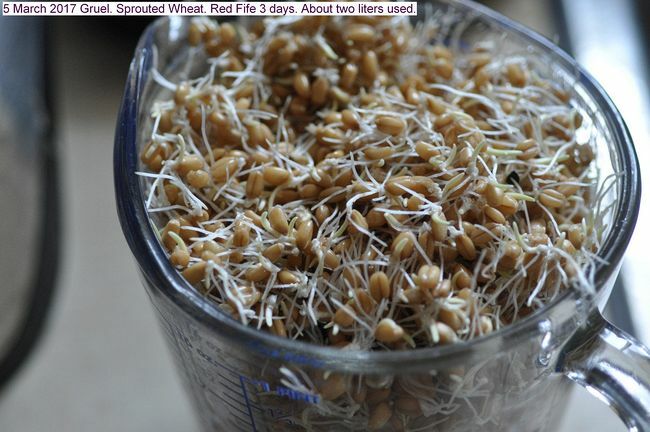 Ingredients are red fife sprouted wheat two liters which take about three days to sprout. Nixtamalized Indian corn, colored, from my garden. It was nixtamalized previously and dehydrated. Half a liter of almonds, half a liter of flax, and half a liter of raw sunflower seeds. Each grain is blended into a slurry. All are mixed in a double boiler and cooked for two hours. The end product is stored in sealed plastic containers and frozen until required. A bowl is ingested for breakfast daily with milk. It is assumed to be nourishing and basically replaces all commercial cereal. This entry was posted in Uncategorized and tagged 5 March 2017 Gruel, Breakfast Gruel, Gruel. Bookmark the permalink.